A unique sunblock formulation, based on the latest nano technology, it is designed to deliver sun-protective properties deep into the skin. Of SPF 25, it provides broad spectrum protection from the sun’s UVA and UVB rays. Containing natural antioxidants and rehydrants, like vitamin E, green tea, carrot seed, ginseng, sunflower oil, it blocks out harmful sun damage, maintaining the desired moisture level, removing tan and visibly lightening skin colour. A non greasy formulation, it provides a smooth matte texture, leaving the skin soft, radiant and youthful. Price: Rs. 139 for 80 gm. 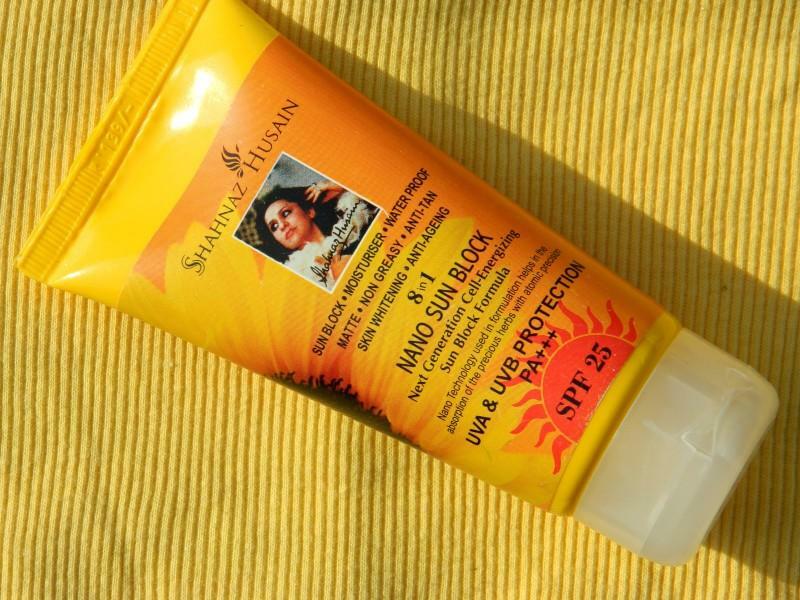 As you all know I have a huge collection of sunscreens and from that collection, I thought to use Shahnaz Husain 8 in 1 Nano sun block and share the review with you all as mostly people come for searching only affordable brands on my blog and this is a total affordable sunscreen so I thought it would be good to share its review first. The consistency of this sunscreen is quite flowy and if you press the tube hard, you might get an excess amount out so you have to be careful not to press the tube hard. The fragrance of this sunblock is floral like and some may like and some may not like the smell. I personally don’t like its smell much. It needs extra pressure and time to totally let it absorb which is really frustrating and I have to literally spend 5-6 minutes in rubbing it or else it makes my face look horror white. It’s not for days when you are in a hurry as you’ll need a whole lot time to properly blend it. After rubbing it properly and when I think it has fully absorbed, I feel that my skin looks dehydrated and dry and it also makes me sweat a lot though it does not feel greasy nor does it leave a white caste, chalo that’s one plus point!! It has SPF 25 which I think is very less looking at how harmful sun rays are being nowadays. And moreover if you have applied this sunblock, makeup does not go on properly, nothing will go over it as it feels a bit sticky and anything on top of it goes with very difficulty and it can be a bit tacky. So, it’s for days when you are planning to stay indoors and not for days when you are planning to stay out all day or even for a half day. For me, you know how important is sunscreen application and re-application but with this sunblock, I can’t even re-apply it as it feels quite messy and re-application is too tacky with it, it does not go on properly and I have to wash my face in this cold weather if I re-apply it. Now let’s spill the beans of its 8 in 1 nano technology..
Moisturizer: No way, it dries out my skin. Waterproof: Absolutely not, in my opinion no sunscreen or sunblock is water proof. Non Greasy: Yes, for me at least it’s non greasy. Anti-Tan: Not much, SPF 25 is not of much use, so can’t comment on anti tan part. Skin Whitening: No comments please!! Not at all whitening. Anti-Ageing: Does it have anti-ageing ingredients :/ Anti-ageing, not for me!! Non greasy, would be good for oily skin. But wait, I heard someone saying that this didn’t work even for her oily skin and made her skin more oily so guess, it’s not even for oily skin. Does not leave a white caste. Has some good natural ingredients. Re-application is very difficult with this sunblock. Very hard to blend and takes 5-6 minutes to get fully absorbed. Makeup won’t go properly over it as it feels quite sticky. SPF 25 is not sufficient for outdoors. Not for people with dry skin. It would be a good option for you if you have oily skin and you spend most of your day indoors but it’s a total no-no for dry skin or if you don’t love sunscreens that makes you sweat a lot. The good thing about it is that it does not leave a white caste nor feels greasy but then you have to rub it hard to properly blend it which results in waste of time and effort too. And I saw someone commenting that it didn’t work even for her oily skin and made her skin more oily (that’s Lisha) so I think it’s not for anyone. Too bad it’s drying. Great review hun. lovely detailed review dear.. this looks as though it will work for my oily skin but 2.5 makes me rethink whether to buy this or not.. Skip it Mayuri, not worth it!! Thanks di, better skip it. Its drying! bad Nicely reviewed dear! Ya too bad and some say it’s oily too :-? Don’t try this one, try something else as SPF 25 is not enough for summers. Glad you liked it, give it a try if you find it good!! never heard of this but thanks for sharing vl stay away from this now! I’ve tried this an absolutely hated it. It made me tan terribly and made my skin just so oily. After the Horrible experience with this I stopped using ayurvedic sunscreens altogther! What a waste! Thanks for telling us …i will stay away from it! You have so many products Arzoo! i hate applying sunscreens really !! it make me look ghostly lol. But you should never skip sunscreen, find one that suits you and does not make you look like ghost. Omg, I feel shahnaz products are not worth the hype… nice honest review dear ..
Ughhh…it dries out the skin?? Not for me!! Such a dud.. total waste of money..